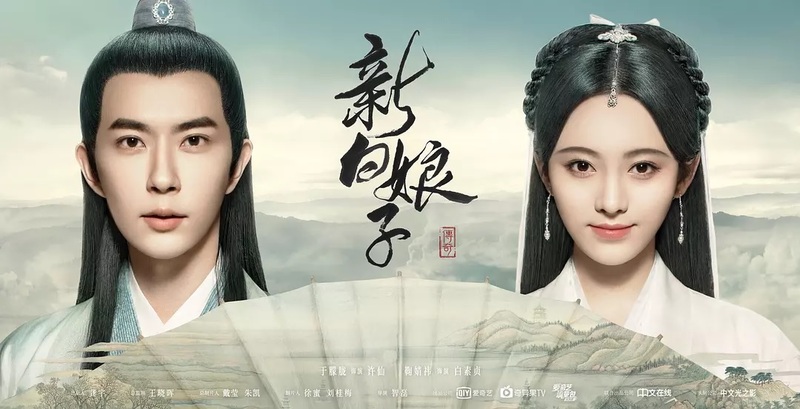 This is recap of The Legend of White Snake Chinese Drama Episode 1, Bai Suzhen saves Chang Sheng at the street when she picks up the pearl. He tells her that his mouth contained the pearl when he was born, and it cannot be lost. She asks him why he let people see it when it’s so precious. Chang Sheng says that his father broke his legs and his mother is sick. 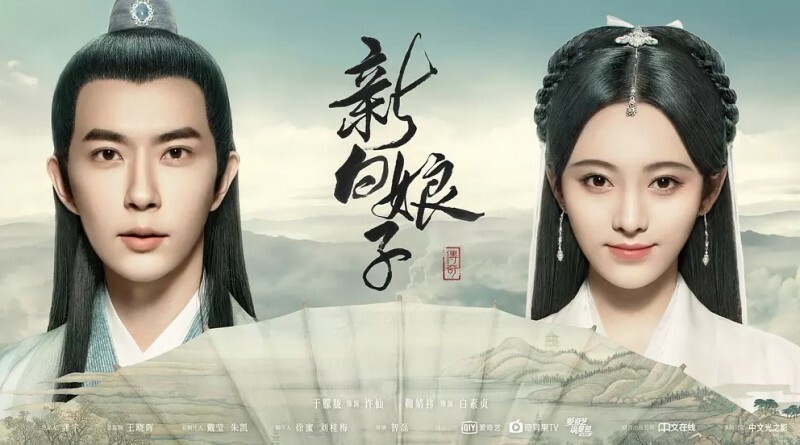 Note: From here on out there are specific plot spoilers for The Legend of White Snake Chinese Drama Episode 1. Bai Suzhen climbs up from the lake and asks Jing Song to help her. The squirrel turns into a male, Jing Song. He helps her, and she asks him if he knows who she is. He says that they have been neighbors over one millennium, but is stunned by her looks. He teases her that she is ugly when she moves. She tells him to turn around until she knows how to walk. He thinks she can boost her immortal power with her looks, and reminds her if she eats one person… But she stops him and mentions Goddess of mercy saved her in Yangzhou. She doesn’t want to disappoint Goddess of mercy, and decides to follow her. Goddess of mercy asks who is on knees. Bai Suzhen explains that she is a white snake of Emei mountain, and she was luck to get human body through Goddess of mercy’s immortal dew. So she wants to leave the world of mortals and follow Goddess of mercy. But Goddess of mercy thinks Bai Suzhen didn’t get in the world of mortals, and asks her if she knows why immortals get human bodies first before getting into heaven. She says that human have seven loves and six desires, so they must learn to take it down and run away from the world of mortals. Bai Suzhen says that she will get in the human world and improve her immortal power. She shows up at the street, and the mirror shop owner is lost when seeing her. His wife pinches his ear and calls Bai Suzhen evil spirit. Bai Suzhen asks the woman how she knows she is a evil spirit, and thinks she is evil spirit as well. The woman feels wronged and thinks Bai Suzhen’s families are evil spirits. Bai Suzhen says she is the only evil spirit in her family, and realizes evil spirit is the appellation of name-calling. So she walks to the corner and gets changed. She wears the flower as hairpin. Xu Xian sets up his clinic at street. But the men of Shennong sect are against it, and fight with Xu Jian. The leader asks him if he know martial arts when Xu Xian subdues him. Xue Xian thinks the man’s points aren’t stable, and asks him if he feels hot and cold sometimes. The man says that his chief thought he can live to ninety-nine because his face was red. But Xu Xian says that it’s not a good sign, and threatens the man that he will die anytime. The man is scared and asks Xu Xian how to treat it. Xu Xian reminds him the fee, and the man pays it. Bai Suzhen spots the two men talking about Xu Xian. They think Xue Xian is the legend of doctor, Hua Tuo. Bai Suzhen doesn’t expect that she can see the immortal doctor, and wants him to teach her some medical skills. The man blames Xu Xian for using cold medicine to the cough patient, and mentions the medical book. But Xu Xian points out the patient has wound on his ribs. The patient admits that he fell down from rooftop during work, and his ribs got hurt. Xu Xian tells him that he gets wound cough, and thinks the doctor harmed him. The man flees but smiles at Xu Xian. Bai Suzhen thinks Xu Xian is too arrogant, and his looks isn’t Hua Tuo. Fa Hai spots a little girl at bamboo forest but calls her beast. She claims she isn’t intention to harm human, but he thinks they get immortal power through evil paths, and asks her to get death. The girl turns into a white tiger and attacks Fa Hai. Fa Hai fights with her, but she turns into Buddha. Fa Hai tells his teacher about it. But teacher thinks Fa Hai couldn’t recognize the beast and Buddha. He tells him that he will become demon when he has killing intention, and the beast can become immortal when she is kind. He tells Fa Hai that there is a millennium beast staying at Lingan, and gives him the purple gold bowl and rod. He reminds him that he cannot move when the rod doesn’t move. Bai Suzhen spots the man getting rid of her mustache, and knows he is a girl, Jin Ruyi. The maid asks Jin Ruyi if she got recognized, and thinks Xu Xian will feel grateful to her. Jin Ruyi says that she acted bad doctor to highlight Xu Xian. Bai Suzhen thinks Xu Xian is a jerk and decides to punish him. Jin Ruyi rushes out and blames Xu Xian for his late, and threatens to reduce his salary. He explains that he went to buy her oil cake. The maid says that Xu Xian remembered it when Jin Ruyi mentioned. He mentions Jin Ruyi acted fake doctor, and Jin Ruyi asks for the money he earned. Bai Suzhen pushes Jin Ruyi over with her immortal art. Jin Ruyi finds out her hairpin is broken and threatens to sell off the maid. Xu Xian picks up the flower from tree and wears it on Jin Ruyi’s head, and tells her to replace the hairpin with flower. But she thinks she isn’t village girl and is shy to leave. Bai Suzhen gets out and remember Goddess of mercy said not to disrupts human rule with beast power. So she decides to report it to feudal official. The maid thinks Jin Ruyi doesn’t like flower. But Jin Ruyi says that it was Han Wen brother’s mind. The maid warns Jin Ruyi that her father will scold her if he knows she called Xu Xian as Han Wen brother again. But Jin Ruyi says that it cannot be changed as she has called it since she was a child. Bai Suzhen wants to accuse Xu Xian of pretending to be the legend of doctor, Hua Tuo. But the officer tells her that Xu Xian is his chief’s brother-in-law, and threatens to arrest her. Bai Suzhen decides to warn the liar, Xu Xian. She dresses up to be a man, and warns Xu Jian to be honest. She mentions he lies to be Hua Tuo, but he asks her if she saw Hua Tuo. She tells her to correct his mistake, and returns the money to her. But he takes off mustache and wants to scold her. He is stunned by her looks and forgive her. But he asks her out still. Bai Suzhen notices the beast power with bloody smell and realizes it’s evil beast. She trips Xu Xian on the road by mistake, and he asks her to explain it. He threatens to send her to feudal official while holding her hand. She blows to his face and flees. He thinks she is frivolous. Li Gongfu tells his wife Xu Jiaorong that there are many children killed in Lingan, and the bloody clothes was hung up on the door. She worries about him because it’s a beast who likes to boy, and thinks he cannot defeats him. But Li Gongfu doesn’t believe there is any beast in the world. Xu Xian agrees while returning home, and thinks his brother-in-law can frighten the beast. Xu Jiaorong threatens not to serve them, and asks Xu Xian about Mr. Yu’s illness. Xu Xian says that he will prepare some herbs for her. Xu Jiaorong feels relieved because the child Chang Sheng is too pitiful. Xu Xian spots Chang Sheng’s toy and asks Xu Jiaorong about it. She says that he is playing at the gate. But Xu Xian says that he didn’t spot him, so they go to look for Chang Sheng. Chang Sheng tells the pawn owner that the pearl he took when he was born. But the pawn owner thinks Chang Sheng makes up a story to trick him, and throws away the pearl. Bai Suzhen saves Chang Sheng at the street when she picks up the pearl. He tells her that his mouth contained the pearl when he was born, and it cannot be lost. She asks him why he let people see it when it’s so precious. Chang Sheng says that his father broke his legs and his mother is sick. So he wants to mortgage the pearl and gets money to treat his mother’s illness. Bai Suzhen brings a string to the pearl and wears to Chang Sheng’s neck. He calls her fairy and thinks she walks down to save his mother. He takes her to pass by Li family, and says that he forgot to inform them when he left. Bai Suzhen tells him to visit them, and goes to visit the beast. Xu Xian runs into Chang Sheng and tells him to report Xu Jiaorong before he leaves. Chang Sheng is excited to tell Xu Xian that he ran into fairy, and she promises to treat his mother’s illness. But Bai Suzhen disappears. Xu Xian tells Chang Sheng that she must be liar when someone says that she can treat illness with magic. But Chang Sheng thinks fairy won’t cheat human. Bai Suzhen wonders why the beast power disappears when she arrives at the tea shop, and hides herself when she spots Fa Hai. Fa Hai’s rod moves. Bai Suzhen runs away and thinks Fa Hai is fierce. The female beast doesn’t fear Bai Suzhen because she is just a snake. But the male beast warns her that Fa Hai takes rod and asks her if she heard the bell tone of death. She laughs and wants to see Fa Hai’s power. Xu Xian takes Chang Sheng down from the tree, and gives him the herbs. But Chang Sheng mentions Xu Xian lies to be Hua Tuo. Xu Xian explains that he just uses his knowledge, and asks Chang Sheng to get a fan for him. Chang Sheng takes the fan and wonders when the fairy will come and thinks she cheated him. Bai Suzhen shows up, and Chang Sheng is excited to take her to see his mother. Bai Suzhen finds out the woman gets poison of snake, and tells Chang Sheng that she will treat his mother. Xu Xian walks in, and Chang Sheng takes Bai Suzhen to see Xu Xian. He tells him that the fairy came to save his mother. Xu Xian recognizes Bai Suzhen and thinks she doesn’t even forgive a boy. But she blames him for wronging her when he cannot save his patient. Chang Sheng stops their argument, but Xu Xian asks Chang Sheng why he calls him uncle but calls Bai Suzhen older sister. Xu Xian promises Bai Suzhen that he will let her be disposal if she can save Chang Sheng’s mother. Bai Suzhen asks Chang Sheng the places his mother went to. He says that she went to Nvwa temple at ten miles hill. The men in the temple wonder where their chief went, and find the green snake Xiao Qin eating the barbecued fruit. She complains that she cannot live in winter, but the man ponits out she lived over 500 winters. She brags that he will hurt women’s heart as men, and spots Bai Suzhen walking to her. She jumps down and thinks she cannot disappoint Bai Suzhen since she is given to her. The men notice Xiao Qin’s nose is bleeding. Bai Suzhen spots Xiao Qing’s tail and asks her if she is the green snake. Xiao Qing stares at Bai Suzhen and asks her if she wants her to take care of her. Bai Suzhen asks for the antidote, but Xiao Qing asks Bai Suzhen to obey her. Bai Suzhen thinks Xiao Qing flirts with her and wants to give her a lesson. She takes the rope and makes Xiao Qing fall down. Xiao Qing turns into green snake, and Bai Suzhen turns into white snake as well.